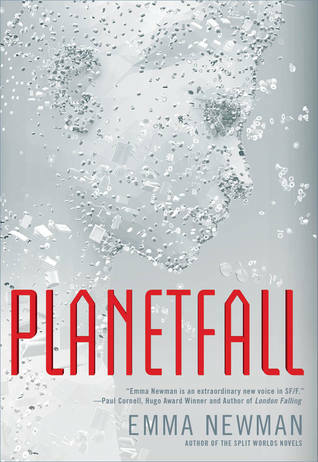 Read a full summary of Planetfall by Emma Newman below. If you can’t remember what happened in Planetfall and you need a refresher, then you’re in the right place. The book opens with Ren looking through stuff in the Masher. This doesn’t really seem relevant at the time but you should make a note of this for later. Ren gets a message from Mack, as he has seen someone walking towards the colony. Mack gets his gun ready, and he and Ren talk about how “they” should be dead. They go to meet this person, who is dehydrated and starving. It turns out he’s the child of two other colonists who supposedly died, and the grandchild of Suh-Mi. His name is Sung-Soo. Ren takes Sung-Soo to Kay’s infirmary. They find out that he is unchipped, and he has a tapeworm in his stomach, which seems to allow him to eat plants that the others can’t. Kay and Ren used to date. Ren had a daughter who died at the age of three. She met Suh-Mi in Paris when they were roommates. Sung-Soo starts trying to get involved with life in the colony. He carves pendants for people. We learn more about Planetfall and what led the group to this planet. Suh-Mi ate a weird alien plant and fell into a coma. When she woke up, she knew that she had to get to the planet. She gathered a group of people and they started to prepare to set off into space. Sung-Soo starts to bug Ren. He is very insistent on getting to know her and getting inside her house. Mack asks Ren to plant the Seed this year. Every year, God’s City creates a seed for the people, which is what their new religion is based on. Apparently Suh-Mi is up there with God, and is sending the Seed down to her people. Except it’s actually Mack putting the Seed there every year. Ren gets into God’s City and plants the Seed. Sung-Soo basically forces his way into Ren’s house and we discover she’s a hoarder and is suffering from some sort of PTSD and anxiety. There’s junk everywhere. Sung-Soo tells Ren she has to clear it out. Sung-Soo comes back and tries to help Ren clear the house but she’s having none of it. Ren returns one day to find Sung-Soo telling everyone in the colony about the hoarding. They gather around her house and force their way inside. They start taking her stuff. Ren freaks out. Eventually, after clearing most of the stuff out, they find a hidden door. They open it, and they find Suh-Mi’s body there. It turns out that Suh-Mi died during the first Planetfall. The first landing group were exploring God’s City, and Suh-Mi went through the wall. She came back out after some time, and then said that she “took too long”, and then killed herself by taking off her helmet. No one told the rest of the people this. The only people who knew were Ren, Mack, and Sung-Soo’s parents. This caused conflict between the group, and Sung-Soo’s father tried to convince Ren that they needed to tell everyone. Mack tried to have Sung-Soo’s father killed for this because he didn’t agree. He wanted to go with the religion idea. Unfortunately for Mack, Sung-Soo’s father survived, and so Sung-Soo was born. Sung-Soo then starts an uprising in the colony. His people – who AREN’T dead – arrive and start taking over. The pendants were actually markers, and the people who wear them are kept alive because they’re useful. Ren escapes into God’s City. She eventually finds the wall that Suh-Mi went through and she herself goes in. She finds a body there. She takes its place.